Modernity in Canada is a new chapter in the series of linked exhibitions that tell the ongoing story of the Group of Seven under the umbrella title The Group of Seven: Revelations and Changing Perspectives. The exhibition includes artworks by the Group members and the artists with whom they were associated, primarily in Central Canada. Although the Group of Seven has been generally perceived as the dominant national school of art, their associates of preceding and same generations were no less influential in their contribution to Canadian art. 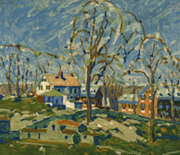 From its conservative beginnings in nineteenth-century Academism to the development of Canadian modernity, the paintings featured in this exhibition demonstrate the creative and divergent paths that Canadian art took during the turn of the century and particularly the first half of the twentieth century. Canadian art of this time grew out of both assimilation with and reaction against the modern styles and themes that were streaming in from Europe and America. Many of these styles were inspired by the art of the French Impressionist movement and that of the Post Impressionists who in their creative diversity introduced innovative modes of representing the world around them. Nevertheless, together they held a common ground in the depiction of their immediate and familiar surroundings, seeking to portray the places they saw, visited and knew best. Working in an environment of artistic fervour and exchange,these artists represented the spirit of their times. Modernity in Canada: The Group of Seven and Their Times is curated by Sharona Adamowicz-Clements, Assistant Curator. Photo: David Milne (1882 –1953), Houses in Sunlight, 1910-1911, oil on canvas, 44.5 x 51.5 cm. Gift of the Founders, Robert and Signe McMichael, McMichael Canadian Art Collection, 1966.16.19. Over 10 thousand fund values.